This study had the objective of quantifying greenhouse gas (GHG) emissions from different manure management practices and dairy farm sizes. A comparison of the main practices among farm sizes was also conducted to highlight practices that are able to minimize GHG emissions. First, a survey was sent to Wisconsin dairy farms to collect information on manure management, machinery power, and time of operation. Manure management practices include d collection, transportation, storage, land application, and processing (anaerobic digestion (AD), solid-liquid separation (SLS), and sand separation (SS)). Second, modelling tools were used to estimate GHG emissions based on farm size and practice. Four farm sizes have been evaluated: small (1-99 animal units, 1 AU = 1,000 pounds of animal), medium (100-199 AU), large (200-999 AU) and permitted facilities (≥ 1,000 AU). Three representative farms were modeled for GHG emissions based on survey results: a small farm (75 AU) handling 1.8 ton solid manure/day, a large farm (425 AU) handling 21.7 ton liquid manure/day, and a permitted facility (2,000 AU) handling 140 ton liquid manure/day and with manure processing. 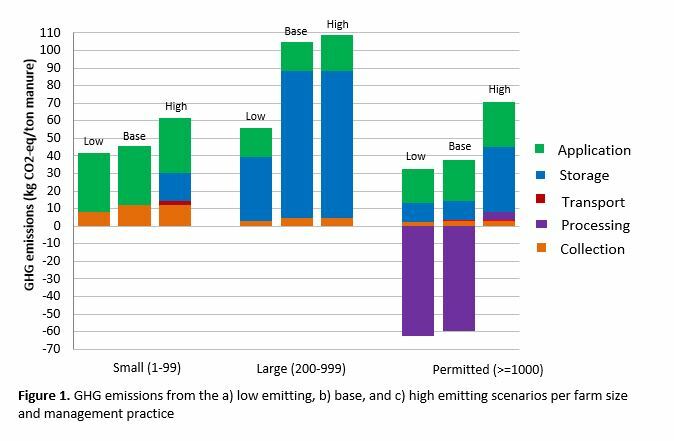 In addition, a base case scenario with the most representative practices for each farm size, and a low and a high GHG emitting scenario were modeled to analyze potential mitigation strategies (Table 1). Nitrous oxide (N2O) after manure land-application is the major contributor to GHG emissions in small farms (Figure 1). Most small farms land-apply manure daily or have short term storage. Emissions can be reduced by using a barn cleaner instead of a skid steer as it is more efficient in terms of energy consumption. The high emitting scenario in small farms indicates that adding long term storage would increase GHG emissions mostly in the form of methane (CH4) from storage. Storage is the major contributor to GHG emissions for large farms, where most emissions occur in the form of CH4. Storage CH4 emissions can be reduced by minimizing the storage retention time or by using a cover. Despite that manure storage has implications on air quality, its role is crucial for water quality purposes and therefore, removing the storage structure from the dairy farm is not a feasible option. Manure processing is an interesting GHG mitigation strategy as shown in the permitted facility scenarios (Figure 1). AD and SLS achieve significant GHG emission reductions, where negative emissions indicate that AD displaces more GHG emissions from the production of grid electricity than the emissions coming from all manure handling processes. Injecting manure instead of surface applying it has proven to reduce ammonia emissions, but it resulted in an increase in N2O emissions in our model. 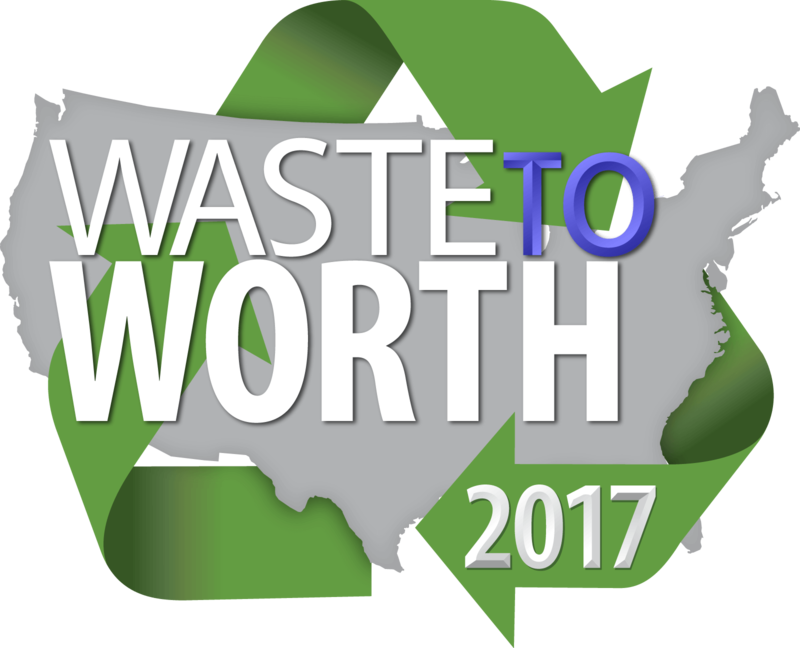 There is opportunity for future work analyzing data collected in the survey. These data include nutrient use, crop yields, bedding use and replacement, and milk yield and characteristics, which can be analyzed in the context of farm size and management practices. Aguirre-Villegas, Horacio Andres. Assistant Scientist. Department of Biological Systems Engineering, University of Wisconsin-Madison. Aguirre-Villegas, Horacio A., and Rebecca A. Larson. 2017. “Evaluating Greenhouse Gas Emissions from Dairy Manure Management Practices Using Survey Data and Lifecycle Tools.” Journal of Cleaner Production 143: 169–79. doi:10.1016/j.jclepro.2016.12.133.